Arizona State University is gearing up to produce more and better-prepared school teachers, addressing a critical need in classrooms around the state. In fall 2013, ASU will offer a new certification program and several new bachelor’s degrees that can lead directly to a teaching career. 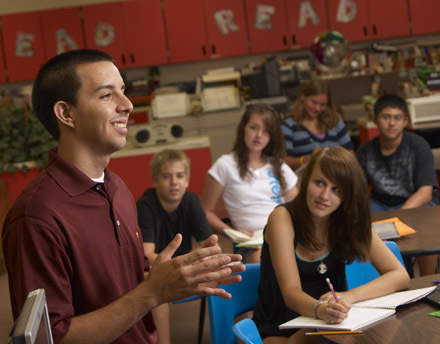 The Mary Lou Fulton Teachers College has worked closely with other ASU colleges and with the Arizona Department of Education to roll out the new pathways to teaching careers. Students have asked for them, as many realize by their sophomore year that they’d like to be teachers, but they’re reluctant to switch majors. Currently a bachelor’s degree with high school teaching certification is available only through the Teachers College, as a major in secondary education with a concentration in a content area. Math and science majors in the College of Liberal Arts and Sciences, for instance, must return for post-graduate work in order to be certified. Because of the teacher shortage, particularly in math and science, many middle- and high-school teachers are working outside their strengths, teaching subjects in which they have little background. The new undergraduate certificate for secondary education that leads to teacher certification already has about 45 students who plan to enroll, though it was just launched in February. It is a university certificate, making them eligible for state certification. The program may require students to take more than 120 credit hours to graduate. Many students majoring in history, English and math begin searching for a career path in sophomore or junior year, she says. Some have always wanted to teach. The new program will provide a way for them to stay within their majors, yet be certified to teach by the time they graduate. Students in any major which allows a number of electives can enroll in the program, as long as they don’t wait too late in their college career to sign up. In a true partnership, Teachers College also has worked with units in the College of Liberal Arts and Sciences (CLAS) to design four new bachelor’s degrees: a B.S. in mathematics with a concentration in secondary education, a B.A. in history with a secondary education certificate, a B.S. in physics with a concentration in secondary education, and a B.A. in English with a concentration in secondary education. With an especially critical shortage of math teachers in public schools, faculty in ASU’s School of Mathematics and Statistical Sciences have hoped for years for such a program. The new Common Core State Standards for Mathematics, in which more seventh and eighth graders study algebra and many high schoolers are led into calculus, add an extra push for putting math majors as teachers in high school classrooms. Fabio Milner, professor of mathematics and director of mathematics for STEM education, says there’s been a great deal of interest among students. Still, creating a new major has not been easy. Milner also has worked with Teachers College to beef up the math content for students working toward a B.A. in elementary education, helping create four new content courses. History faculty in the School of Historical, Philosophical, and Religious Studies also have been working for years toward such a degree, hiring Lauren Harris in 2011 with a joint appointment as assistant professor of history education in both the Teachers College and CLAS. She is enthusiastic about the possibilities for the new program. The new physics degree program is part of the Physics Teacher Education Coalition, funded by the American Physical Society and the American Association of Physics Teachers. Currently two-thirds of high school physics teachers lack a major or a minor in physics, according to Robert Culbertson, associate professor of physics who has helped develop the new program. A new version of Urban Devil, a mobile app that lists events happening on and near ASU's Downtown Phoenix campus, is now available in app stores and online. A new version of Urban Devil, a mobile app that lists events happening on and near Arizona State University’s Downtown Phoenix campus, is now available in app stores and online. "Urban Devil was good before, but it is even better now,” said Jarrod Nelson, a student who was part of the student development team. “My favorite part of Urban Devil 2.0 is that you can share your favorite events and deals on Facebook and Twitter. I also love that there are more deals and event available to students. The new Urban Devil has shown me new, fun places in downtown Phoenix I never knew about." The newest release adds more automated streams from the most active downtown events venues and makes it easier for local businesses and organizations to submit student-friendly events and specials directly into the app. It also makes it easier to enter events spanning multiple dates and enables all users to share events they like with friends via email, Twitter and Facebook. 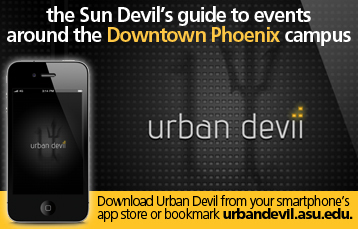 The free app can be downloaded in the iTunes and Google Play stores and is also available online at urbandevil.asu.edu.